First, let’s create a new DocumentDB database so we can start exploring this service; three things need to be created: an account, a database, and a collection (where data is actually stored). An account can host multiple databases, and each database can host multiple collections. 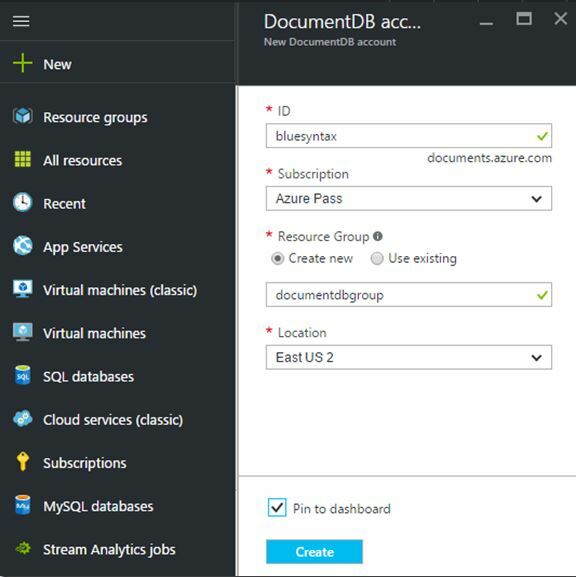 From you Azure portal (https://portal.azure.com) find DocumentDB from the list of available services, and create a new DocumentDB account. The Resource Group is a logical container allowing to group, view, and manage related services. The screenshot below shows the information I have provided. Once the account has been created, the screen changes to show you a menu of options from which you can create databases; of importance, DocumentDB allows you to change the default consistency of your no-sql databases (no-sql database consistency is an important concept as it can impact performance, availability and consistency – see Consistency levels in DocumentDB); we will keep the default setting. Also note an important configuration property: your keys. Locate the Keys configuration menu to reveal your access keys. 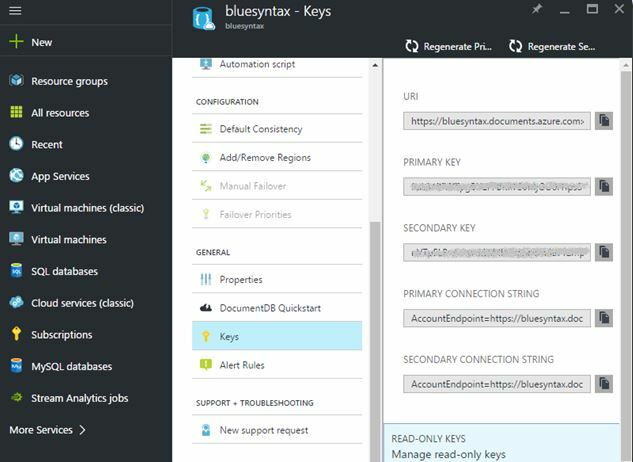 Note that DocumentDB allows you to manage read-only keys as well. Select Overview from the top of this menu, and click on Add Database and enter a database identifier (which is the database name; my database is called ‘testdb’), and click OK.
Once the database has been created, you will need to create a collection. Select the database to open up a new panel, and click on Add Collection. Enter the necessary information and click OK (see the information I provided below; my collection name is logdata; I also changed the Throughput to 400 to reduce the cost since this is a test collection). At this point, we are ready to access this collection and start adding records (in proper no-sql speak, we will be adding documents). Before jumping into the code, let’s make note of the following information since this will be needed later to connect to DocumentDB. Let’s create a class that holds a single log entry in our DocumentDB collection. The class name is LogEntry. We need to have a unique identifier for every document, and it must be called Id. Then, we will create a simple Console application that does two things: it can add a new document in our collection, and it can list all the documents from the collection. The following is the complete code for the console application; note the private variables on top that represent the configuration settings identified previously. By pressing 1, the console application connects to DocumentDB and adds a record to the LogData collection. By pressing 2, the console application fetches all available documents and displays them on the screen. Note that if you have a large number of records, you will need to add logic to page the operation (let’s say 100 documents at a time for example), and handle retry logic operations if the service is too busy. This simple introduction to DocumentDB provides a quick overview of the simplicity of this service, along with a sample project for creating and accessing documents. Although DocumentDB is very easy to configure and use in code, many advanced features (not covered in this introduction) are available around performance, security and availability. For a deeper understanding of DocumentDB, please refer to the online MSDN documentation, and the QuickStart provided in the DocumentDB menu inside the Azure Portal. Hi sir, please share your knowledge as you like.